Have you ever dreamed of practicing yoga in the scenic and spiritual Himalayan mountains? Are you a beginning, intermediate or experienced yoga practitioner? Do you love trekking, camping, and exploring new cultures and environments? If you've answered yes to one or more of these questions, the this retreat is for you! During the retreat you will be taught by professional Indian yoga instructors; whom of which have 500 hours of advance yoga and over 200 hours of yoga teacher training certificates. Chhape Ram will take take you through Pranayama Classes (breathing techniques), Gentle Yoga, and Thai Yoga Massages. Each day, you'll be exposed to the wonders of Indian culture, nature and the spiritual lifestyle! Your expert guide will be the wonderful, lively and kind hearted Chhape Ram. Chhape has dedicated his life to organizing and delivering trekking throughout India, and has a plethora of knowledge and expertise in this area. You will be met at the airport by a member of the retreat staff and transferred to a high quality hotel in Delhi. Whilst waiting for the rest of the party to arrive, you are free to immerse yourself in the sights, sounds and tastes that is Delhi; or simply relax in your comfortable and clean hotel. When everyone has arrived and checked in, we will have a meet and greet and head out for an evening meal together: a way to celebrate the beginning of a beautiful journey. You'll have another opportunity to spend the day sightseeing in Delhi. At 5pm, you'll be transferred from your hotel to the Volvo night bus (free blankets provided), which will take you to the 'base camp' in Vashisht, located in the Kullu Valley. The journey takes approximately 12 – 14 hours. Our arrival will be around 8am in Manali, with a short transfer to the Ram family homestay in Vashisht. Daily breakfast and dinner will be provided by the Ram family, while you are living in the homestay/hotel. Once again, you'll have the morning to rest in your new home or take a trip to the local hot springs, and allow the natural water to rejuvenate and revitalise you! Before lunch, we will have an orientation about the retreat, where you will be provided with all the information you need. That afternoon you'll have your first yoga class in the shala, practicing asana, pranayama, and meditation. 7 AM Yoga, Pranayama and asana practice for 2 hours. Breakfast—9.30am After breakfast, there will be a guided walk to Jogney Falls. These beautiful waterfalls are about an hour's trek along the valley wall north of Vashisht. These falls descend from high above and run into the Beas River below. In the evening, there will be a meditation class and then dinner. You will stay in the guest house or hotel. 7 AM Yoga, Pranayama and asana practice for 2 hours. Breakfast—9.30 After breakfast . 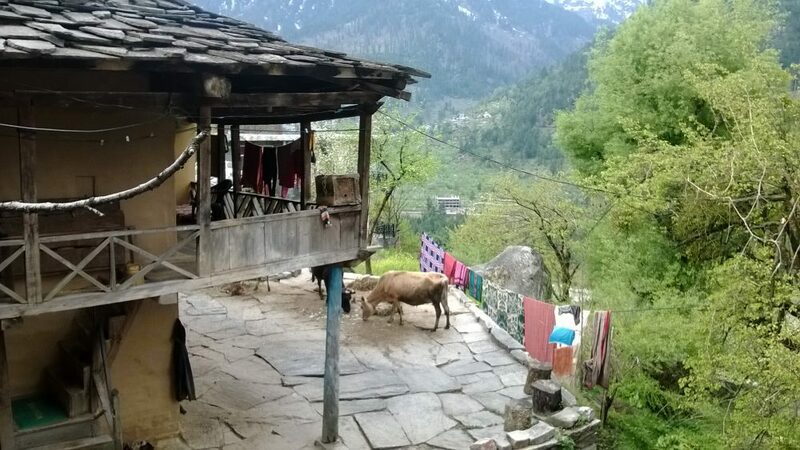 Visit the village of Goshal , Old Manali and the beautiful Hadimba Temple. Hadimba temple is about one km from Manali - it is very old and surrounded by the tall cedar pine trees on the edge of Dhungri village. According to legends, Bhima one of the Pandava brothers fell in love with an aboriginal woman named Hadimba, the sister of the local chief by the name of Hadimba and married her. In your own time you can take a rickshaw back to Vashisht. Dinner. Night in family house or hotel. Evening we will take meditation class after Dinner. 7 AM Yoga, Pranayama and asana practice for 2 hours. Breakfast—9.30 After breakfast you will have the opportunity to take a walk to Villages . We will walk up along the valley to three distinct villages that dot along the Beas River. We will visit the village of Burwa, Shanag and Goshal, stop for tea at a local family house. Dinner. Night in family house or hotel. Evening we will take meditation class Either Before or after Dinner. Day 07, Yoga , Meditation and visit Nagar castle . 7 AM Yoga, Pranayama and asana practice for 2 hours. Breakfast—9.30 After breakfast you will Drive to Nagar Visit Nagar castle and Roerich art gallery and karishna Ttemple.back to Vashisht , evening meditation. Dinner . 7 AM Yoga, Pranayama and Asana practice for 2 hours. Breakfast—9.30am After breakfast you will walk to Tibetan Ayurvedic doctor for person treatment . half of the group will go to Tibetan doctor to check up and half of the group will go to Indian priest for astrologer to check person problem with spiritual way. Free time - after breakfast you will have free time to relax, enjoy the hot springs, schedule a massage or do a little exploring on your own. Kirtan , Dinner Night in family house or hotel. One can do Canopying or rock climbing as per your own choice for half day. We will help you to book one day in advance . 7 AM , Pranayama class for 30 minute after you will join Havan Puja which is special puja for person life to keep good health and wellness ( shanti life ).Hindu priest will organize it .later after transfer to bus stand to take night Volvo bus to delhi. Night in Bus. Note- Please note that each person are not allowed to eat anything before Puja . they can drink tea/ coffee etc but can not eat anything . so we will take breakfast late after Puja completed , it will take 2 to 3 hrs to complete the Puja which is never fixed time. A deposit of 500 Euro will be required to reserve your place. The full payment needs to be completed before 1 week on arrival. If you request a single room, a supplement of 275 Euro will be required. All rooms are double or twin. Airport Transfer to a hotel in Delhi. Travel from Delhi to Manali and Manali to Delhi by deluxe Volvo bus. On arrival in Manali, you'll be transferred to your retreat accommodation. This will either be the Amar Family Homestay or a local hotel in Vashisht (depending on size of the group). Transport for sightseeing (depending on the itinerary). Yoga asana, pranayama and meditation practice (twice daily, for 11 days as stated in the itinerary). Daily breakfast and dinner in the family house prepared by the family. Experienced local guides for all tours, trekking and hiking. Consultation with a Hindu Astrologer and Tibetan doctor. Twin sharing / double room. A traditional Indian cooking class. What will I have to pay for during the retreat? Below is a simple list of things you'll have to pay for yourself during the retreat. These expenses are minimal, as India is not an expensive country (costs are estimated). Beverages and water, other than those provided at breakfast and dinner in the home stay. (Mineral water 1 litre = 20Rs / 0.26Euros). Monument fees (for example Taj Mahal and sightseeing in Delhi, about 2,000Rs / 27Euros). Lunches while in Vashisht. There are many local restaurants all serving traditional Indian and Tibetan food! (150-250Rs / 2/3Euros). Personal travel insurance and visa costs. Flights to and from India. Massages and other personal activities.